Place your business message on Let's Create! 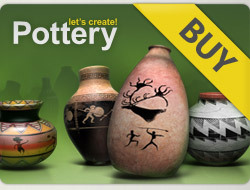 Pottery Community Portal! We offer an effective and low cost website advertising solution that enables advertisers to place their banners on this site in key locations. Sponsorship opportunities also possible. If you wish to know the details make sure to contact us! If you have another ad size or type in campain make sure to contact us in order to discuss the implementation and pricing. We reserve the right to reject any ad that detracts from our site or products. We do not accept pornographic, adult, smoking, drinking, hate, violence, bigotry or other subject matter that society considers offensive.